Single-headed emergency washing device connected to flexible hose used to irrigate and flush the face or other parts of the body. It is the right equipment. You know where it is located and how to use it in an emergency. Departments are responsible for activating eye wash and drench hose equipment once per week to verify proper operation. 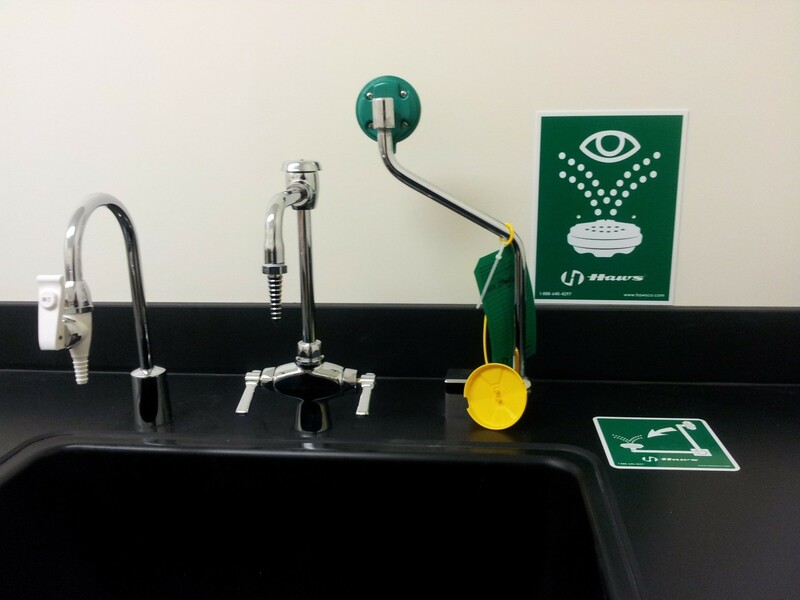 UW Facilities is responsible for checking safety showers annually to verify proper operation. A drench hose is not a conforming emergency eye wash but may be used as a supplementary washing device. Make sure you know where the emergency washing equipment is located and how to use it in an emergency. Refer to Section Four of the Laboratory Safety Manual for information on emergency washing equipment. Evaluate the need for EWE in laboratories and other UW facilities. Assist UW Facilities with capital planning projects and evaluating the need for EWE, the best type and location of EWE to install, and commissioning of EWE as part of new and renovated UW facilities. Assist with retrofit installations of EWE through the Capital Safety Program. How can I find out if I have adequate access to emergency washing equipment? Contact EH&S and request an evaluation. I work in a lab; how often should the eye wash be tested? The eye wash must be tested weekly. What should I do if the eye wash is not operating correctly? Place a work order with your building management to have it evaluated and repaired. I am designing a lab remodel. Where do I find requirements for emergency washing equipment? Refer to Section Four of the Lab Safety Design Guide for this information. Contact EH&S to discuss specifics. Can I use portable EWE instead of plumbed? Generally no; the exception is when plumbed water is not available. are substances that can cause destruction of living tissue by chemical action (e.g. acids with a pH=2.5 or less, caustics with a pH=11 or greater). are designed to wash the eyes and part of the face. is designed to rinse an area of the body under conditions where an eyewash or safety shower are not as effective. Drench hoses are considered supplemental and do not replace the need for an eyewash or safety shower. are substances that can cause a strong temporary inflammatory effect on tissue at the site of contact. of concern are substances that produce a serious injury or illness by absorption through the skin or other body surfaces such as the eyes.